Batman: Arkham City, like other Game of the Year contenders that are in its league, should be praised both for what it does as a video game and what it does for video games. It descends, evolved, from video game classics like Super Mario and Metal Gear. It offers some of the most exciting and exhilarating opportunities for combat and stealth that a person can encounter with a controller in hand. The game is rich with interesting choices for the player to make—many of them in a split second as you figure out which thug to counter-punch next in a 10-on-1 brawl or which building ledge to grapple from a mid-air dive as you race to rescue a hostage in the game's titular prison city. You'll be making decisions each time you try to solve the Riddler's 400 vexing treasure hunts. This abundance of interesting choices is a quality I expect in any good game. It's a standard by which so many Facebook games fall short and for which I believe those who love the likes of Arkham City consciously or unconsciously crave. Beyond games, Arkham City is a digital argument that it is the best Batman thing of the last few years. It dares to be better than the comics from which the character sprang and better than the blockbuster movies. And yet it then winds up having to answer for what video games do with someone else's fiction, a question it mostly has good responses to, but not always. In its ability to immerse its audience in Batman's amazing world, the video game is unmatched. Even the best Batman comics writer says the Arkham Batman video games made by Rocksteady Studios are the preeminent modern Batman experience. Arkham City takes place more than a year after 2009's acclaimed Arkham Asylum, which was a surprise hit for Rocksteady Studios and Warner Brothers. That game earned the backhanded compliment of being the best super-hero game of all time but was also genuinely excellent. 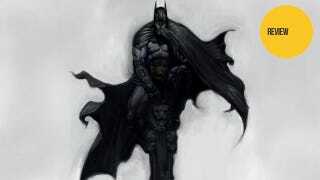 That game confined The Dark Knight to a multi-building asylum set on an island off the coast of Gotham City. The game played in cramped quarters as Batman tangled with regular and super villains. Arkham Asylum somehow reinvented that most common of video game activities, brawling, by introducing an ingenious, freely flowing combat system that allowed those who mash their controller buttons to dynamically punch, kick, grapple and Batarang through crowds of tough-guys. It also let players who were gifted with both superior button-pressing timing and the clarity of mind to vary Batman's fist and gadget attacks the tools needed to elevate such brawls to the artistry of uninterruptible acrobatics. In locked rooms, Batman would be a predator, stalking enemies from the shadows, plucking them off one by one. He could use a delicious array of sneak attacks that would leave bad guys dangling from ceiling fixtures or dozing next to the grate from which Batman sprang up and knocked them out. Arkham City brings Asylum's wonderful brawling and sneaking back, situating it in the grander Arkham City. The new setting is a walled section of Gotham absurdly turned into a slum prison for the city's range of brutish to insane blue-collar evildoers. In the new game, Batman's acrobatic brawls and stealth stalking can and do take place in alleys and streets, on rooftops, in the museum the Penguin took over, in the factory where the Joker lurks, in the over-run Gotham police building—basically both in the places where the game's main storyline dictates and also wherever the player in this more open game chooses to send their hero. Arkham City is a cesspool of villainy, of course, and Batman's there to do the scrubbing. It's a credit to Arkham Asylum that the new game doesn't supplant the first. In gaming terms, that original adventure was more BioShock, a story-driven and mostly linear adventure featuring a trapped Batman trying to defy the manipulations of a mastermind, one hallway, room or courtyard at a time. Arkham City is more of a sprawl in the style of recent Assassin's Creeds, giving Batman and the player more leeway to contend with the crimes of the lead story or get lost in the violent and occasionally brain-taxing challenges of a dozen significant multi-part sidequests. Both games are distinguished by complex, grimy graphics, visually vivid villains and a stellar voice-cast bringing the characters of Batman lore to cartoon life. Their stories, however, are not swappable and are equally memorable. In the first game, the squeaky Joker trapped Batman in the loony bin. In the second, the baritone Hugo Strange, a man who knows Batman is Bruce Wayne, ensnares the Dark Knight into his prison city (though the second game is also about the Joker's poisonous relationship with Batman and, if you see things as I do, implicitly an argument that The Riddler is Batman's true ultimate nemesis). Arkham City can be played more freely than the first, and it will take a focused mind to not be perpetually distracted by enjoyable side activities. The side task are a pleasant mix. Some involve Batman saving the day during seemingly random criminal beat-downs of "political prisoners." A sidequest involving an expert hit-man focuses on detective work: scanning the environment, tracing bullet trajectories, and so on. One involves blowing up six things in the city in order to help a Batman villain. (The game is at its best when it presents moral grays areas, something it too infrequently does.) Another sidequest is an attempt to rescue a man's wife. Some can be finished in 15 minutes. Most require a couple of hours. One appears to require days of dedication. The epiphany of Arkham Asylum was that Batman has been waiting for about 70 years, anachronistically, to be recognized as the perfect video game hero. His comics and movies are a blueprint for a conventional video game. Since the original Nintendo heyday, video game heroes like Super Mario have been battling through hundreds of ordinary, unnamed bad guys in order to reach colorful villainous bosses and then wallop one or two ultimate princess-kidnapping nemeses. So too has The Dark Knight made a career of bruising hundreds of thugs and henchmen while stalking any of a dozen or so colorful rogues, such as Penguin or Poison Ivy, and sometimes facing his Bowser, his ultimate foe, The Joker. The Bat-blueprint seemingly should have produced a great Batman game a long time ago, but Rocksteady got it close to perfect first in Arkham Asylum and expands its effort in expected ways in Asylum. The obviousness of what Rocksteady has done in Arkham City is mostly a benefit to the game though it does set the bar for future games high. They've made a bigger, busier game, to no one's surprise. And they've added lots of characters. To Arkham Asylum's rich cast of Batman villains, the developers have given significant Arkham City roles to many more. They did what the original wave of late 80's and early 90's Batman movies did, adding, adding, adding. More villains, more supporting characters, more gadgets. The length of a feature film and the talents of the filmmakers were incompatible with that increase, but Arkham City digests it better. At every turn of plot or sub-plot there is a fun new or returning villain. But by the main storyline's final hours, the breadth of the cast does feel excessive. Those villains, like the Joker, who are given more screen time, or Mr. Freeze, who gets to have a character arc, are far more interesting than those who take the stage for a battle and then are gone. Those other villains become plot devices or, in a manner that may harm the series in the future, unnecessarily played trump cards. The bulging bag of villains in this game doesn't just present the not-a-bad-problem-to-have of where the creators of the series go next. It highlights the fact that this great Batman experience is lacking in originality. How may we reconcile the fact that this Batman game, which may be the best Batman content of any medium, spends few, if any of its dozens of potential hours adding anything to Batman lore? We have in Rocksteady's work many wonderful adaptations and reinventions of Batman characters, but we are bereft of a great, new character—hero or villain—that will make comic book writers or movie directors envious and grabby. This may be a problem when the list of villains the two-game series hasn't run through is topped now with likes of Killer Moth, the Red Hood and KGBeast. But the series' corner-painting problems are worries for another day and don't detract the excellence of Arkham City (and, to be fair, the Batman movies tend to create nothing, too). Being Batman in Rocksteady's games is extraordinary fun, which is why the game's solid storyline and carnival of villains practically feel like bonuses. Rocksteady could make a game about Batman beating up guys in alleys. Their combat mechanics are so good that I'd play it. That is essentially what they've done with the game's rich Riddler Challenge mode, a separate portion of the game accessible from the game's menu. It puts Batman through a series of locked-room combat or predator challenges. There are nearly 200 goals to pursue in these challenge areas, high scores to chase and even special arrangements of the levels, categorized as "campaign"s that require survival through some very tough gauntlets. This whole Riddler section, separate from the main game's more than 400 Riddler-oriented mini-quests, reduces or elevates Arkham City to an arcade game, a joyous beat-em-up with satisfying crunch. Most top games' base gameplay wouldn't survive the stripping of story and leveling-up from it. That Rocksteady's Batman games do puts them in rare company. In the Riddler challenge rooms and in the main game, Arkham City shows off an improved combat system. It still flows freely as Arkham Asylum's did, but it adds more animations, more fighting moves, and more mid-combat maneuvers that allow more gadgets in the mix. Using all of this keeps fighting feeling varied and fresh. The crowds of enemies Batman is fighting every few minutes of the game also present an expanding array of challenges. Those who hurl crates must be dealt with differently than those who approach with riot shields raised or those who swing knives. Each must be blocked, countered, disarmed or evaded differently. As Arkham City goes on, it gets better, mixing those enemy types into the gangs Batman is repeatedly having to mix it up with. All players will have to learn how to focus on certain enemies and switch tactics on the fly. This is where they'll make most of their interesting, instant decisions. The proliferation of Riddler stuff in the game suggests that the green-coated villain may be the real ultimate bad guy in Arkham City. Officially, he's not. He's barely involved in the game's main plot, but he turns out to be Batman's most effective foe and the one who most makes the player feel like Batman. The Riddler is the one villain who taxes both Batman's combat abilities and his brain, and by extension the player's reflexes and mind. He is responsible for the littering of 400 trophies in the game, some of them outside, some of them inside, all of them requiring fancy footwork, clever climbing or unconventional gadgetry to unlock. Some of them, even when discovered, are locked in devilish, brain-teasing ways. Should you use the remote Batarang to knock a switch to uncage this one? Should you fire a cable to a wall, walk it like a tightrope and grab the other? But what about the frozen one and the three in the gaseous death trap? When you're not using your brain to sort these things out, you will be able to use your reflexes to get the locations of more Riddler trophies added to the game's main map. You do this thanks to a smart system that paints green just one bad guy in any crowd of bad guys Batman encounters. You must beat up the green guy last, so suddenly, you're having to be choosy. It's so clever, because it requires you to use restraint while fighting gangs of hooligans, in order to smack that green-glowing guy around last. If not for the Riddler's devious challenges in the game, playing Batman would feel more brutish. Rocksteady are clearly more comfortable presenting Batman as a fighter than a detective. They've found more fun in the former, hence the entirely separate arcade version of Arkham City. Aside from tracking the Riddler's trophies, they give players very little opportunity to feel as if they're in command of Batman's intelligence. A couple of sidequests do involve tracking forensic evidence, but otherwise the idea that Batman is smart is underplayed. Thankfully, the idea that Batman is crafty is emphasized, hence the many interesting moment-to-moment decisions that the player needs to make during brawls and stealth predator moments. Arkham City does not include the option to play as Catwoman on the disc, but sequences that let you control her in the city and in a parallel story that sees her tangle with Two-Face and Poison Ivy are available as a free download for people who buy the game new (or you can pay to download it). To experience the Arkham City at its best, the content is essential. As riskily as Batman's rogues gallery expands in this new game, his roster of friends grows only slightly yet with great promise. Robin is barely in the game. Nightwing is supposedly sequestered to the game's Riddler challenge rooms. Catwoman is the lone ally (occasional ally, really) who we get any significant time with in the main game and the only one who we can control in Arkham City. She's a little more Spider-Man-like in how she gets around, and she's written differently, more as a camp character. She's also a welcome break from being Batman. One can easily imagine a Batman game that lets players control Robin, Nightwing or even the international cast of Batman, Inc. and if it could be as pleasant to experience as seeing Arkham City from the perspective of two different protagonists was in this game. In the broader context of Bat-lore, Arkham City is a spectacular remix of classic Batman characters. It is an amplification of another experience, Arkham Asylum which provided better modern wish fulfillment of feeling immersed in Batman's world than we've gotten even from the thrilling Christopher Nolan Batman movies. As a comics reader, I still prefer Batman comics from the likes of Grant Morrison and Scott Snyder best. They chronicle the character with few restrictions about the kinds of stories their medium will allow and they continue to innovate with new characters and narrative in a manner video games seldom do. By contrast, the lack of original content in a game that is otherwise so masterfully made is a mild disappointment, but only when viewing Arkham City from afar. Zoomed into Arkham City, there are very few modern gaming experiences that are superior to playing as Batman in Rocksteady's second Dark Knight effort. Dynamic, exciting, full of fun characters, stuffed with things to do and built upon gameplay that is so good that it shines even when the bait of plot development and ability-upgrading is removed, Arkham City is a magnificent game that merely risks, as far as Batman games go, being untoppable.